Sakula is the Spiritual Director and a guiding teacher at Portland Friends of the Dhamma. She is married with three children and three grand children. Her hobbies are art, hiking, camping, bicycling, and travel where she and her husband Alistair partake in all of the above. 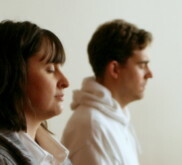 A guided meditation by Sakula, Spiritual Director of Portland Friends of the Dhamma during Sunday Sila.